What's the right amount of monthly data for you? 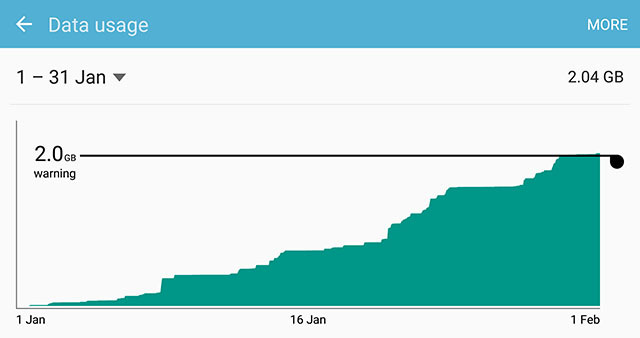 The amount of monthly data you need really depends on what you use your phone for. If you need it for work, the chances are you’ll be sending emails and browsing the web. For that type of use, a 500MB allowance should be enough. If you use your phone for leisure – things like streaming music, videos and games – then 2GB data is probably the minimum amount you need a month, and even then you’d need to be careful with video streaming. How can you save data? Do you love social media? If so, you should beware of those videos that play automatically on Facebook and Twitter. Because they're steadily eating away at your data allowance, even if the volume isn’t turned on. Android: You should be asked by Gmail if you want to ‘Show pictures’ when you open an email. If you select this, it will ask you if you always want to see images from this sender. If this doesn’t happen, go to Gmail’s Settings > select an account > Data usage. iOS: Settings > Mail, Contacts, Calendars > turn off Load Remote Images. Unfortunately, this may not work for all emails, depending on sender. If you think this might be the cause of your data haemorrhaging, try waiting until you’re connected to Wi-Fi before you open emails with the paperclip icon to see if they really are to blame. How to save Netflix shows to a MicroSD card. When it comes to the likes of Spotify, you can lower the streaming quality by going to Settings > Music Quality or save playlists offline, so you can listen to them wherever you like. Keeping tabs on how much data you’re using will give you a good indication as to which apps are to blame. You can track this on Android by going to Settings > Data Usage (pictured above), and you can also set notifications so you know when you’re nearing your data limit. If you’re an iPhone user, we’d recommend you download My Data Manager from the App Store. It's free, and also available for Android users from the Google Play Store. This will give you a comprehensive breakdown of your data allowance. You can also check out your network supplier’s app. If it's any good, it should give you some useful data stats for you to mull over. If you've got any data saving advice of your own, let's hear them. Share your top tips below.